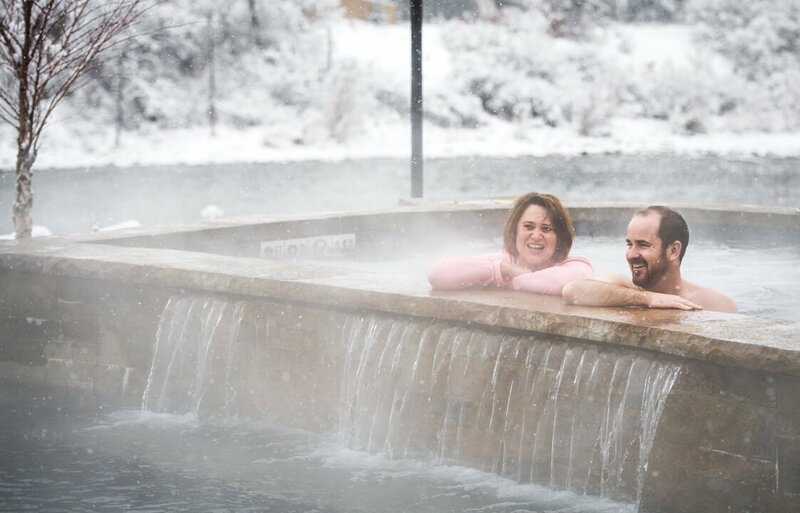 For a classic Colorado holiday, visit Iron Mountain Hot Springs with family and friends over the winter break. Be sure to make note of our special hours for December too. Visiting Iron Mountain Hot Springs on a snowy day in December is a relaxing, fun-filled and memorable way to spend an afternoon or evening with family and friends over the holidays. Come soak after a day on the slopes or even if winter’s just got you going a little stir-crazy. At this time of year, our geothermal waters offer their own form of comfort and joy! Wintertime soaking is the best! Soaking in the 16 mineral hot springs pools that range in temperature from 99°F to 108°F is a perfect après ski-snowboard-snowmobiling-sleigh riding activity and one that we like to think even the big guy in the red suit would approve of. However you like to spend your time playing in the snow, afterwards the warm water combined with the 14 minerals found in it, works wonders to untangle knots and soothe sore muscles. Even if winter sports aren’t on your itinerary, being outside on a chilly day is still an invigorating experience worth seeking out. Getting into a pool when temperatures are in the single digits might seem daunting, but trust us; the walk from the bathhouse to the soaking pools is a short one along heated walkways and worth a minute or two of exposure. Once you’re immersed and cozy warm, socializing with fellow pool-goers is a convivial way to pass the time. While we don’t roast chestnuts on our open fire pits, the braziers do add warmth and a seasonal glow to the holiday atmosphere. Hot springs soaking is also a quintessential Colorado activity. Out-of-town guests here for holidays are especially appreciative of the opportunity to soak. While there are approximately 200 commercial hot springs in the U.S., they are not evenly distributed across all 50 states; most, like Iron Mountain Hot Springs, are concentrated in mountainous regions. 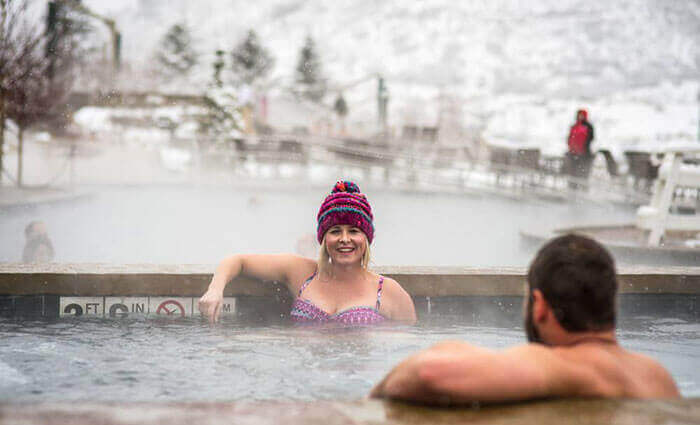 Our out-of-state visitors, especially from the Midwest, tell us soaking at Iron Mountain Hot Springs is a highlight for them that adds to the holiday magic of a Colorado vacation. To ensure you have a holly jolly time at Iron Mountain Hot Springs, we want you to know about some changes to our normal hours this month. Monday, Dec. 17, closing at 5 p.m.
Christmas Eve, Monday, Dec. 24, closing at 5 p.m.
Christmas Day, Tuesday, Dec. 25, closed all day so our employees can spend the holiday with family. New Year’s Eve, Monday, Dec. 31, regular hours closing at 10 p.m.
New Year’s Day, Tuesday, Jan. 1, open regular hours from 9 a.m. to 10 p.m. Happy Holidays from our family to yours. We wish you a season overflowing with love, joy and happiness.